Summary: This is one of the Yorkshire Dales more challenging walks which requires precise navigation. There are many delights to be discovered during the course of the walk. 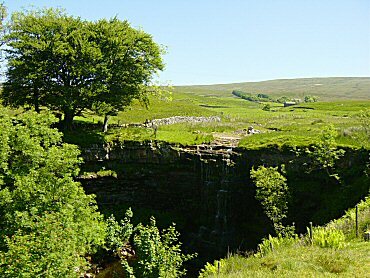 I found a few challenging gill scrambles and some great hidden waterfalls on the navigational section from Wild Boar Fell to Uldale House. This alone would make for a great walk but there were many other highlights in 13 miles of utterly enjoyable walking. 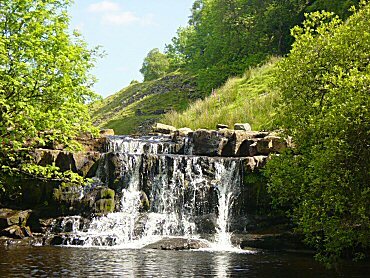 The northern Yorkshire Dales were not easily accessible for me at the time I did this walk. It was a 60 miles drive just to reach the start but I had planned to explore Wild Boar Fell and Uldale for some time and the weather forecast was just perfect so off I went. Driving through the congested Lower Wharfedale valley through Otley and Ilkley to Skipton was a sufferance I had to bear but suffer it I did. I then continued through and across the divine dales countryside of Upper Wharfedale, Langstrothdale, Oughtershaw Moor and Wensleydale in beautiful sunshine until I reached Garsdale Head where I took the Kirkby Stephen road to Aisgill Moor cottages. The sky was brilliant blue when I left home and it was still brilliant blue on arrival. I knew the walk would be a great one. With the weather set fair it would be fantastic. The first highlight of the walk came soon after I had set off. 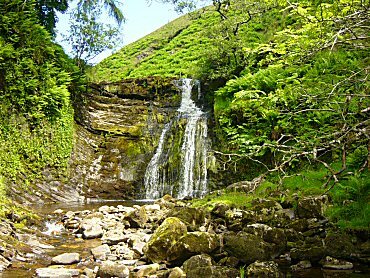 Hellgill Force is a popular waterfall as it is so easy to visit. Even motorists only have to walk a couple of hundred yards from the B6259 road to view the water cascade. The fair weather had put paid to a spectacular for me though. Hellgill Force was but a mere trickle. I hoped for better cascades in Uldale. The contrast between my familiar southern dales and these northern dales was immediately apparent. 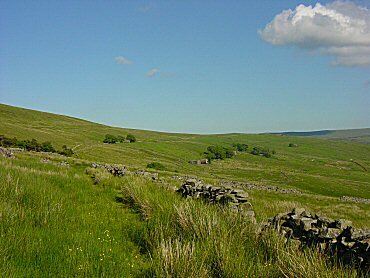 There is a more wide open feeling to the walking, it being similar terrain to the North Pennines just to the north of the National Park boundary. After my slight disappointment at the feeble flow of Hellgill Force I walked north and climbed steadily to Cumpston Hill. 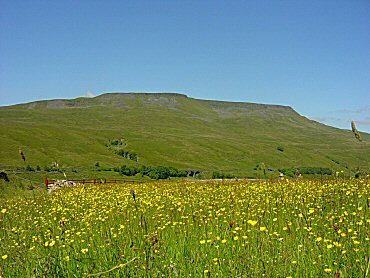 The views west over profuse buttercup yellow meadows to Wild Boar Fell were breathtaking. The views east to High Seat and Mallerstang Edge were almost as entrancing. The walk along the wide Eden valley at 400 metres was certainly a memorable one. 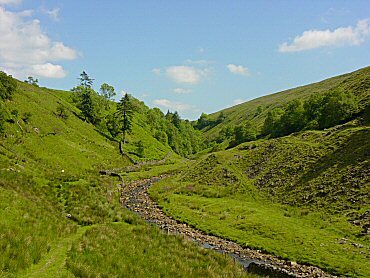 After two miles of exquisite walking I dropped gently down to Elmgill and then crossed the Garsdale to Kirkby Stephen road on the valley bottom to cross the river Eden then walk on a gentle ascent to Hazelgill. After passing the farm buildings, goats, hens, sheep, geese and ducks I walked through a tunnel under the Settle to Carlisle railway line. Then I paused for a drink for it was swelteringly hot (late June, over 25 degrees) and I was now facing a tough climb. Be prepared for action. The climb is steep for a while immediately after Hazelgill. 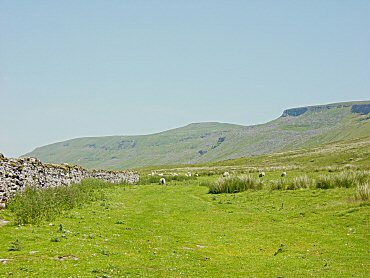 From the railway tunnel the next 2 kilometres involved a climb of over 350 metres to Blackbed Scar and Wild Boar Fell's summit plateau. Being quite steep in part the climb was the hardest work of the walk so far but as I was to find out not the hardest part of the walk. More on that later. Now I climbed and climbed constantly taking breathers to admire the views above me and also those being created from where I came down below. When I had reached High Dolphinsty I paused to look over north west into Ravenstonedale. It was a marvellous sight looking down into the expansive area with white limestone pavements and the silhouette of the Lakeland fells beyond. I looked out to the North Pennines too and immediately spotted the distinctive white golf-ball shaped dome observatory building on Great Dun Fell twenty five miles to the north. 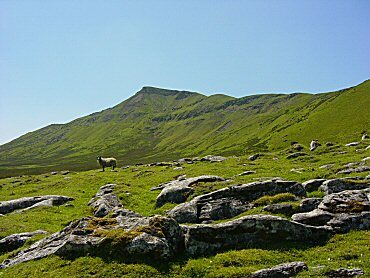 The views afforded to me this day were the best, typical of what makes walking so special for me in England. The scenery on a beautiful day in summer is second to none. I was once again in my element as I enjoyed the expansive views and wandered along the plateau edge to Scriddles, the Nab and then Blackbed Scar. 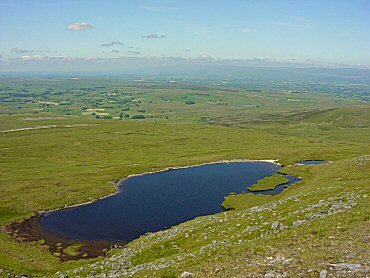 At the scar I looked over the Yorkshire and I could clearly see the distinctive shapes of Pen-y-ghent and Ingleborough twenty miles south. There were recognisable hills in all directions. From Blackbed Scar I walked on the Wild Boar Fell plateau for 500 metres to arrive at the summit trig point. My only companions were a few sheep and a pair of curlews. The sheep looked sheepish as I passed then went about their business. The curlews lost interest when I avoided the reedy area they were hovering around. I settled into the rounded shelter at the trig point and enjoyed lunch. While doing so I studied the map to work out my course from here to Uldale. It was already plotted onto the GPS for back up but after I left the fell top I would be walking on less trodden ground. So far I had followed established paths and would be doing so from Uldale to the finish. But this link from Wild Boar to Uldale had to be forged anew. There was no path on the map to follow. 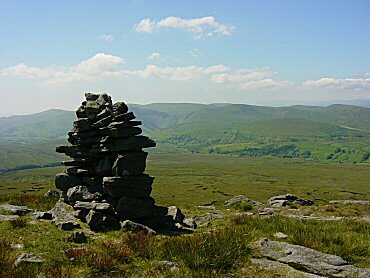 There was a line of cairns to follow from Wild Boar Fell to Swarth Fell. 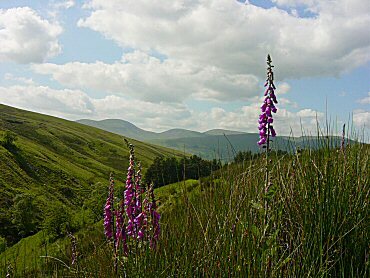 I would use them to reach Uldale Gill. Then I would follow the gill down all the way to Uldale House. Easy! Before I left Wild Boar Fell I promised myself I would seek out Sand Tarn. It was not difficult being quite close to the summit and I am glad I called by. It was a delightful looking tarn in a privileged lofty setting with fantastic views of the Howgill Fells to the west and Ravenstonedale to the north west. The walking was remarkably easy considering there were no marked paths. At a cairn on the plateau edge at approximately SD751981 I decided to head in a beeline for the convergence of Grain Gill and Uldale Gill (SD738973) which hence becomes Needlehouse Gill. It was a decision made easy because of the visibility. The walk down off the fell looked very easy and indeed it was. There were a few short steep sections and a few bogs to cross but that is par for the course. It was an easy route to forge. No problems so far. I clambered down to the source point of Needlehouse Gill and enjoyed the next half hour scrambling down the gill and coming across lots of secluded waterfalls. It was joyous. And more fulfilling knowing not many had forged this way before. The going was generally easy but I had to make many crossings of the gill so it is not something I would say is for the less adventurous, and especially in wetter conditions. I was in and around the gill at its most behaved. Sometimes the gill really narrowed and forced me upwards. If here then make right for the left is wooded and has obstructing fences. The ups and downs to from and to the gill were rewarding for the views and for the gems of waterfalls but it was also wearing due to the heat. In the gill there was no breeze at all. I was perspiring lots of water and had to make sure I replenished it. By the time I had negotiated Needlehouse Gill and arrived at the track to Uldale House (SD730969) I was a little bushed and on a regular walk I would have found the easiest option to the finish. But I had travelled 60 miles and was so close to more splendid sights which I just had to see. It would take more work but I just had to do it and so after yet more water intake (I was beginning to need water constantly now, both inside and out) I dropped down from the track after Uldale House and headed down to a noise I could hear coming from the River Rawthey. After a scramble down through a small wood I ended up at the young river at approximately SD730964. I walked into the centre of the river (it was not deep and there were plenty of rocks to walk on) while enjoying the cool shade of the tree lined river and looked straight ahead upstream to a delightful located waterfall which I have called Lower River Rawthey Falls (see photograph). 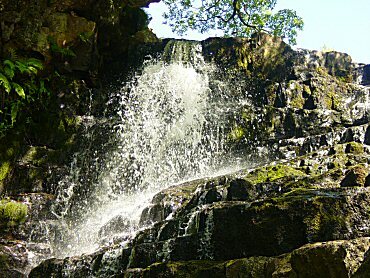 I approached the waterfall, took an intended shower from its spray to cool off, and then clambered up the side. This surely would not have been possible after rains but I enjoyed my chance during the waterfalls respite. I then made my way upstream and after about 100 metres came across another superb waterfall which I have called the Upper River Rawthey Falls (see photograph). They were less dramatic than the lower falls but in a sunnier and gentler setting. Delightful. I had been completely satisfied by all the wondrous waterfalls I had come across. All that remained after the excitement of the last couple of hours in the gills and rivers was a casual walk over open countryside. It would have been if I hadn't been so jiggered. It would have been if the marked path was easy to follow. I was jiggered and it was not easy to follow. At least not the first two kilometres from Whin Stone Gill Bridge (SD736961) to near Rawthey Gill Foot (SD747946) which was uphill and often boggy in long grass. During the section I often dowsed my overheating head with water taken from the river. After Rawthey Gill Foot the path became clearer, the grass shortened by the obliging sheep and thus the course was much easier. 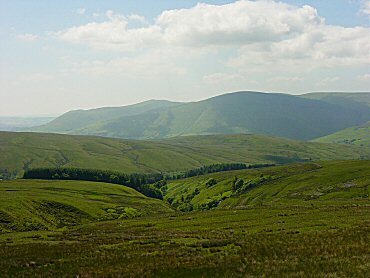 The views opened out over the expansive Grisedale Moor and feeling revitalised by the easier going I made good purchase to cover ground until I reached Grisedale Common and cut north over Rowan Tree Side and back to Aisgill Moor. Wow, what a walk I enjoyed and what finds I had made. I have not explored these northern dales enough. I will be doing so now.